Dave Hibbert scored for the fifth game in a row as Shrewsbury came from behind to beat Dagenham, who had Scott Doe sent off late on for using an elbow. Paul Benson's spectacular drive from 20 years gave the Daggers an early lead. Shrewsbury equalised just seven minutes later when Lewis Neal set up Hibbert's low shot from 10 yards. Dean Holden and Craig Disley went off injured in the first half for Shrews, but substitute Steve Leslie clinched the points with an overhead kick. "The first 10 minutes were fantastic, to be honest I thought the first 15 to 20 minutes were OK and Paul Benson scored a fantastic goal. "I felt for the 15 or 20 minutes after we scored we stopped doing the things that we preach and let in two bad goals, from our point of view." 90:00+5:27 The match has reached full-time. 90:00+4:39 Direct free kick taken by David Button. 90:00+4:39 Booking Roman Vindelot is shown a yellow card for unsporting behaviour. 90:00+4:24 Roman Vindelot gives away a free kick for an unfair challenge on Terry Dunfield. 90:00+3:53 Free kick taken by Darren Currie. 90:00+3:53 Booking The referee shows Joe Skarz a yellow card for unsporting behaviour. 90:00+3:48 Unfair challenge on Roman Vindelot by Joe Skarz results in a free kick. 90:00+2:16 Lewis Neal takes a shot. Blocked by Roman Vindelot. 90:00+1:34 Shane Cansdell-Sherriff concedes a free kick for a foul on Paul Benson. Direct free kick taken by Jamie Day. 90:00+0:55 Short corner taken by Steven Leslie from the left by-line. 88:22 The assistant referee signals for offside against Dave Hibbert. Tony Roberts takes the free kick. 88:10 Roman Vindelot delivers the ball, save made by David Button. 87:48 Free kick awarded for an unfair challenge on Peter Gain by Kevin McIntyre. Mark Arber takes the direct free kick. 87:16 Peter Gain takes a shot. Save by David Button. 87:01 A cross is delivered by Abu Ogogo. 86:19 Terry Dunfield challenges Marlon Pack unfairly and gives away a free kick. Free kick taken by Mark Arber. 85:53 Jake Robinson is caught offside. Indirect free kick taken by Tony Roberts. 85:17 The referee blows for offside. Mark Arber takes the free kick. 84:14 Substitution Darren Currie comes on in place of Daniel Spiller. 83:22 Terry Dunfield produces a cross, Header from deep inside the area by Dave Hibbert goes over the bar. 81:29 Danny Taylor sends in a cross, Abu Ogogo manages to make a clearance. 78:48 Direct free kick taken by Tony Roberts. 78:48 Substitution Wesley Thomas comes on in place of Danny Green. 78:48 Foul by Joe Skarz on Mark Arber, free kick awarded. 76:41 The ball is swung over by Steven Leslie, clearance made by Jamie Day. 76:08 Danny Green concedes a free kick for a foul on Joe Skarz. Joe Skarz takes the free kick. 75:38 Lewis Neal produces a left-footed shot from just outside the penalty area that goes harmlessly over the target. 73:51 Jake Robinson crosses the ball, clearance by Roman Vindelot. 72:08 Direct free kick taken by Shane Cansdell-Sherriff. 72:08 Substitution Roman Vindelot is brought on as a substitute for Josh Scott. 72:08 Booking Peter Gain receives a caution. 71:58 Lewis Neal fouled by Jamie Day, the ref awards a free kick. 69:50 Direct free kick taken by Terry Dunfield. 69:50 Sent off Scott Doe is sent off by the referee for serious foul play. 69:38 Free kick awarded for an unfair challenge on Terry Dunfield by Scott Doe. 68:28 Terry Dunfield fouled by Josh Scott, the ref awards a free kick. Direct free kick taken by David Button. 66:52 Outswinging corner taken from the right by-line by Danny Green, Peter Gain takes a shot. Save made by David Button. Josh Scott decides to take the corner short. 66:33 Josh Scott takes a shot. Joe Skarz makes a clearance. 65:55 Dave Hibbert challenges Scott Doe unfairly and gives away a free kick. Direct free kick taken by Tony Roberts. 65:30 Shot from just outside the box by Peter Gain misses to the right of the goal. 65:14 The ball is swung over by Danny Green, Shane Cansdell-Sherriff makes a clearance. 64:36 Steven Leslie is caught offside. Free kick taken by Tony Roberts. 64:23 The ball is crossed by Joe Skarz, Peter Gain makes a clearance. 64:11 Steven Leslie delivers the ball, Abu Ogogo makes a clearance. 63:36 Jake Robinson takes a shot. Save by Tony Roberts. 59:47 The official flags Dave Hibbert offside. Tony Roberts takes the free kick. 59:08 The ball is crossed by Peter Gain. 59:01 A cross is delivered by Danny Green. 57:16 Steven Leslie produces a left-footed shot from inside the area that clears the crossbar. 57:07 The ball is sent over by Jake Robinson, Scott Doe manages to make a clearance. 56:47 Dave Hibbert takes a shot. Scott Doe gets a block in. 56:26 Danny Green delivers the ball, save made by David Button. 55:32 Marlon Pack produces a left-footed shot from just outside the box that goes wide left of the target. 55:26 Peter Gain produces a cross, clearance by Kelvin Langmead. 54:54 Free kick awarded for an unfair challenge on Scott Doe by Dave Hibbert. Direct free kick taken by Tony Roberts. 54:25 Shot from just outside the area by Dave Hibbert misses to the right of the target. 53:22 Free kick awarded for a foul by Peter Gain on Kelvin Langmead. Direct free kick taken by Shane Cansdell-Sherriff. 52:42 The ball is sent over by Peter Gain, Paul Benson takes a shot. Save by David Button. 52:21 Corner taken right-footed by Danny Green from the right by-line, Shane Cansdell-Sherriff manages to make a clearance. 52:08 Centre by Danny Green, clearance by Joe Skarz. 50:58 Free kick awarded for an unfair challenge on Terry Dunfield by Marlon Pack. David Button takes the free kick. 48:38 Corner taken by Lewis Neal, Mark Arber makes a clearance. Joe Skarz produces a cross, clearance made by Jamie Day. Corner taken by Lewis Neal from the right by-line, Kelvin Langmead has a headed effort at goal from close in which goes wide of the left-hand upright. Correction - 46:27 Daniel Spiller sends in a cross. 46:27 The ball is sent over by Lewis Neal. 46:07 The offside flag is raised against Dave Hibbert. Free kick taken by Mark Arber. 45:30 Jake Robinson takes a shot. Save made by Tony Roberts. 45:00+6:45 The whistle is blown to end the first half. 45:00+6:20 The assistant referee signals for offside against Dave Hibbert. Free kick taken by Scott Doe. 45:00+5:54 The referee blows for offside against Josh Scott. David Button takes the free kick. 45:00+5:07 Shane Cansdell-Sherriff concedes a free kick for a foul on Daniel Spiller. Daniel Spiller takes the direct free kick. 45:00+3:35 Assist by Dave Hibbert. 45:00+3:35 GOAL - Steven Leslie:Shrewsbury 2 - 1 Dag & Red Steven Leslie grabs a goal from close range to the bottom left corner of the goal. Shrewsbury 2-1 Dag & Red. 45:00+0:43 Centre by Steven Leslie, Jamie Day makes a clearance. Lewis Neal decides to take a short corner. Kevin McIntyre takes a shot. Danny Green manages to make a clearance. Corner taken by Steven Leslie from the left by-line to the near post. 43:12 The ball is crossed by Peter Gain, Danny Green takes a shot. Joe Skarz gets a block in. 41:50 Lewis Neal is flagged offside by the assistant referee. Tony Roberts takes the indirect free kick. 40:06 Corner taken by Danny Green from the left by-line to the near post, Dave Hibbert makes a clearance. 39:16 Free kick awarded for an unfair challenge on Kelvin Langmead by Josh Scott. Free kick taken by Shane Cansdell-Sherriff. 38:30 The ball is crossed by Peter Gain. 38:00 Shane Cansdell-Sherriff concedes a free kick for a foul on Josh Scott. Direct free kick taken by Danny Green. 36:42 Shot by Dave Hibbert from just outside the area goes over the net. 35:30 Lewis Neal produces a cross, Tony Roberts makes a save. 35:15 Lewis Neal decides to take the corner short. 34:54 Jake Robinson takes a shot. Clearance by Jamie Day. 34:06 Effort from deep inside the area by Steven Leslie misses to the right of the target. 29:01 Direct free kick taken by Joe Skarz. 29:01 Substitution (Shrewsbury) makes a substitution, with Steven Leslie coming on for Craig Disley. 29:01 Booking Abu Ogogo booked for unsporting behaviour. 28:47 Unfair challenge on Craig Disley by Abu Ogogo results in a free kick. 27:51 Free kick awarded for an unfair challenge on Mark Arber by Kelvin Langmead. Scott Doe takes the direct free kick. 27:12 Josh Scott gives away a free kick for an unfair challenge on Kevin McIntyre. Free kick taken by Shane Cansdell-Sherriff. 25:44 Centre by Abu Ogogo. 23:05 Terry Dunfield produces a right-footed shot from just outside the box that goes wide left of the goal. 22:40 Corner taken by Lewis Neal played to the near post. 22:32 The ball is crossed by Jake Robinson, clearance made by Jamie Day. 22:19 Josh Scott produces a cross, Joe Skarz makes a clearance. 21:42 The ball is crossed by Terry Dunfield. 21:11 Danny Taylor sends in a cross, clearance made by Jamie Day. 18:52 Outswinging corner taken right-footed by Danny Green, clearance by Shane Cansdell-Sherriff. 18:45 Centre by Danny Green, Joe Skarz manages to make a clearance. Correction - 18:00 Substitution (Shrewsbury) makes a substitution, with Danny Taylor coming on for Dean Holden. 18:00 Substitution Dean Holden goes off and Danny Taylor comes on. 17:05 Effort on goal by Joe Skarz from long range goes harmlessly over the bar. 16:28 Corner taken right-footed by Craig Disley from the left by-line, Marlon Pack manages to make a clearance. 15:46 Effort from inside the area by Jake Robinson misses to the right of the goal. 14:39 Josh Scott gives away a free kick for an unfair challenge on Shane Cansdell-Sherriff. David Button restarts play with the free kick. 12:42 Assist on the goal came from Lewis Neal. 12:42 GOAL - Dave Hibbert:Shrewsbury 1 - 1 Dag & Red A goal is scored by Dave Hibbert from deep inside the penalty area to the bottom left corner of the goal. Shrewsbury 1-1 Dag & Red. 10:54 Inswinging corner taken by Danny Green, save by David Button. 9:42 Kelvin Langmead concedes a free kick for a foul on Mark Arber. Tony Roberts restarts play with the free kick. 9:05 Lewis Neal fouled by Abu Ogogo, the ref awards a free kick. Direct free kick taken by Craig Disley. 8:34 Corner taken by Craig Disley from the left by-line to the near post, Danny Green manages to make a clearance. 8:21 Centre by Joe Skarz, clearance made by Paul Benson. 7:53 The ball is swung over by Dave Hibbert, clearance made by Abu Ogogo. 6:26 Marlon Pack challenges Dave Hibbert unfairly and gives away a free kick. Direct free kick taken by Kevin McIntyre. 5:09 Danny Green provided the assist for the goal. 5:09 GOAL - Paul Benson:Shrewsbury 0 - 1 Dag & Red Paul Benson finds the net with a goal from inside the box to the top left corner of the goal. 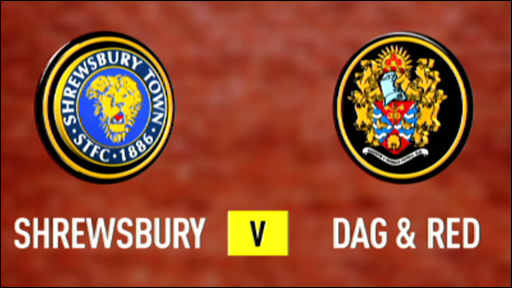 Shrewsbury 0-1 Dag & Red. 3:39 Kevin McIntyre is flagged offside by the assistant referee. Tony Roberts restarts play with the free kick. 1:53 Jake Robinson is flagged offside by the assistant referee. Tony Roberts restarts play with the free kick. 0:23 Free kick awarded for an unfair challenge on Jamie Day by Craig Disley. Mark Arber restarts play with the free kick.